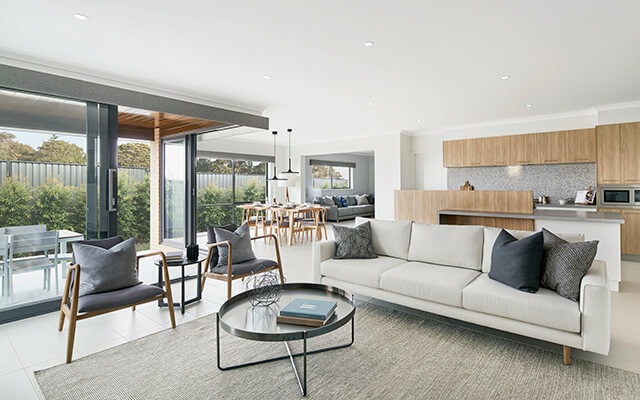 The new Hartley 333 display from Dennis Family Homes at Imagine estate in Strathfieldsaye introduces Bendigo home buyers to the full range of Premium inclusions from the 2016 Inspirations Series. “We are very excited to have our first Premium display here in Bendigo and it’s a real pleasure to welcome visitors through one of the best-selling home designs in our range,” says Bendigo Area Manager Sasha Bursac. With three living spaces, four bedrooms and two bathrooms, the Hartley is one of Dennis Family Homes’ most popular designs with a practical floorplan that suits most families, whether they have young children, teenagers or extended family members. The Premium features of the home on display include elements that would have previously been considered optional upgrades, like higher 2550 ceilings, 40mm stone benchtops in the kitchen and the fully-fitted butler’s pantry, and a choice of custom kitchen island and vanity designs. Visitors to the display are welcomed through generous double front doors to a spacious entry hall with the master suite immediately off to the side – a luxurious retreat for parents with his-and-her walk-in robes and a large ensuite with separate toilet. The three minor bedrooms all have built-in robes and are separated from the home’s main hall by a short corridor. The largest bedroom has direct access to the two-way family bathroom, making it perfect for older children or elderly relatives. The kitchen is an entertainer’s dream with an extra-long island bench and a fully-fitted butler’s pantry, complete with sink and extra storage. The oak-look cabinetry featured here is repeated elsewhere throughout the home, in the master bedroom, both bathrooms and the laundry, resulting in a harmonious interior. As the L-shaped living area extends along the side and rear of the home, the design is suitable for a variety of solar aspects and block configurations. As well as the Premium range of inclusions, the Hartley display also showcases other upgrades that have proved popular with Dennis Family Homes customers. In the rear living room, stacking sliding doors open to provide more than five metres of uninterrupted access to the stylish alfresco entertaining area, complete with ceiling fan and cedar panelled ceiling. In the master bedroom suite, the oak-look laminate cabinetry successfully demonstrates how Premium features and optional upgrades can work together and result in a cohesive space. 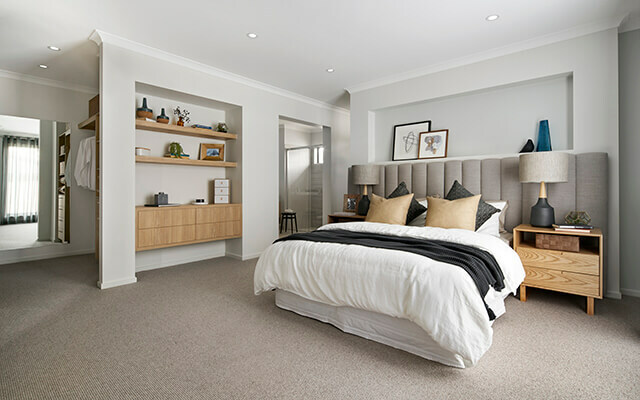 The walk-in robe fit-out is included as a Premium inclusion, while the stylish built-in cabinetry in the bedroom is an optional upgrade that draws the overall design together. Other upgrade choices demonstrated on the building’s exterior include a Colorbond roof and feature render to the front portico. The Hartley design is available in a choice of eight contemporary facades and requires a minimum lot width of 16 metres. The version on display in Bendigo is 33 squares, however the design is available in four sizes ranging from 28 squares through to 36 squares. The display at Imagine estate is open daily from 11am to 5pm at Yirrilil Way, Strathfieldsaye. Further information is available online at www.dennisfamily.com.au or by phoning 1800 DENNIS. Copyright © Dennis Family Homes Pty Ltd ("Owner") 2019. Except as permitted under the Copyright Act 1968, no material anywhere on this website may be copied, reproduced, altered or further disseminated in any form without the prior written permission of the Owner.